A fascinating true crime story that details the rise of modern forensics and the development of modern criminal investigation. At the end of the nineteenth century, serial murderer Joseph Vacher terrorized the French countryside, eluding authorities for years, and murdering twice as many victims as Jack The Ripper. Here, Douglas Starr revisits Vacher's infamous crime wave, interweaving the story of the two men who eventually stopped him—prosecutor Emile Fourquet and Dr. Alexandre Lacassagne, the era's most renowned criminologist. In dramatic detail, Starr shows how Lacassagne and his colleagues were developing forensic science as we know it. 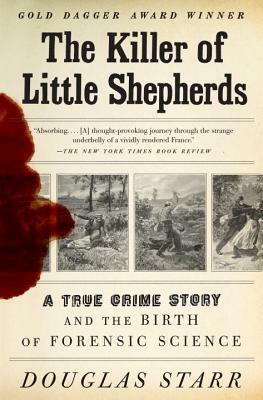 Building to a gripping courtroom denouement, The Killer of Little Shepherds is a riveting contribution to the history of criminal justice. Douglas Starr is codirector of the Center for Science and Medical Journalism and a professor of journalism at Boston University. His book Blood: An Epic History of Medicine and Commerce won the 1998 Los Angeles Times Book Prize and became a PBS-TV documentary special. A veteran science, medical, and environmental reporter, Starr has contributed to many national publications, including Smithsonian, Audubon, National Wildlife, Sports Illustrated, the Los Angeles Times, The Christian Science Monitor, and Time, and has served as a science editor for PBS-TV. He lives near Boston.